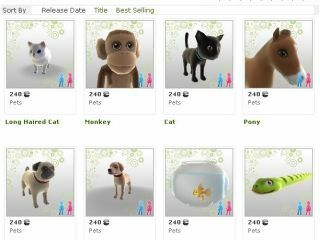 UK Xbox fans can now buy themselves pets for their Avatars on the Xbox Live Marketplace. Of course we're still not entirely sure why people actually buy anything for their Avatar (apart from the AWESOME Assassin's Creed 2 outfit) but it's clearly both popular and lucrative. The pets are only available in the 'men' category at the moment, although community manager Graeme Boyd – or AceyBongos to his Xbox friends – has tweeted to say that this is currently being checked. However, if you just can't bear the thought of being without a kitten, dog or goldfish then you can now pick one up for 240 Microsoft points (£2.00ish). Or you could buy yourself a monkey, parrot or a snake. We'll be limiting our purchase to the Megatron helmet for now.